The previous several pages have discussed various aspects of the high power design. It began with the choice of projectile and moved through the physical and electrical characteristics of the parts directly involved in shooting a slug from a coilgun. Now it's time to examine the low power supporting circuits. The “low power” circuits include everything apart from the 200+ amp pulse discharge path. This includes the power supplies and SCR trigger circuits. 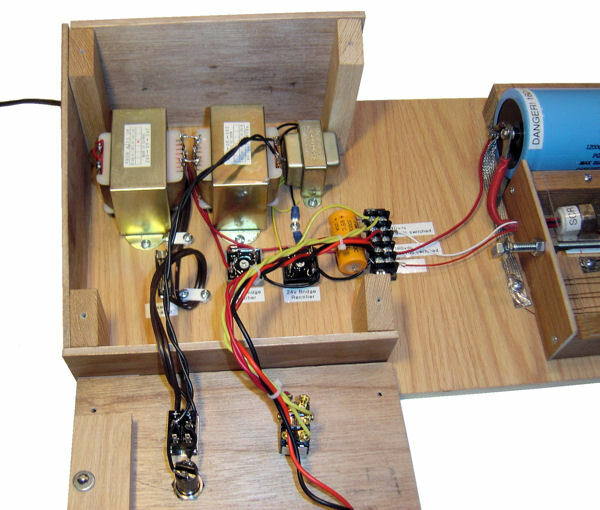 In this implementation, the low power circuits are in a wooden housing to protect them from prying fingers, as shown in the photograph below. The next few pages will discuss the design of each power supply and trigger circuit.